The unique dog names list has names for dogs who deserve something different. While unique dogs are in the eye of the beholder, there are some dogs that are undeniably, well, unique. Take the dog in the picture, for example. 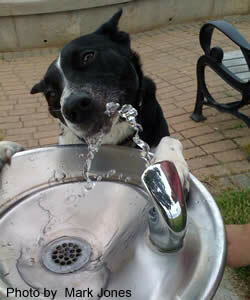 His name is Dash and he is owned by Mark Jones of Jersey City, NJ. Can anyone deny the uniqueness of Dash? Do you have a unique Poodle? How about naming him Doodle. If your pup is the tiniest thing you have every seen, you could always name him Hulk. Or name your big dog Macro and your small dog Micro. For those who love one syllable dog names, there are plenty on the unique dog names list like Zeke, Zip, Jade, Taz and Chan. You won’t find names like Max or Bailey on the list as they are two of the most popular dog names in use today. In fact, both of those names made the top 100 dog names list. Three of my favorite unique dog names are Taz, Noodles and Jazz. I also really like the name Zuri, which means “Beautiful” in the Swahili language. If you have spent much time on this website, you probably know I have a thing for one syllable dog names. While some warn against using one syllable names because they could be confusing to the dog, I have always like them. Just be careful not to use a name that rhymes with a training command. For example, Neal sounds like “heal” and Beau sounds like “No.” Hunting dog names, in my humble opinion, are a great use of the one syllable variety. Below is a list of more than 100 of my favorite unique dog names, many with reasons why I included them on the list. Browse or study the list and have fun. For all boy dogs, check the unique male dog names list. Argyle Argyle is back in fashion today. Are you the preppy type? Maybe your dog is too! Bandit Great name for an American Staffordshire Terrier, or a “Pit Bull” as some people call them. Banzai Do you own an Akita or a Japanese Chin dog? In Japanese, Banzai means “Ten Thousand Years.” While your dog name not live that long, I just think it belongs on the unique dog names list. Bogart Do you remember the famous picture of dogs playing poker? 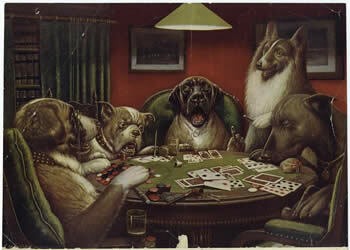 There were several like this from the early 1900s and I imagine at least one of these dogs was named Bogart. Chan I think this also belongs on the Chihuahua names list. Cheyenne A pungent red powder made from ground dried chili peppers. Totally hot, hot, hot! Dancer If you have ever imagined your dog in a tutu, this might be the right name for your pup. Depending on your picture, this might also fit the funny dog names list. Diego My brother-in-law’s dog is named Diego and he is one unique dog. The picture doesn’t do him justice. He runs like a deer and jumps like a kangaroo! Doodle Great name for a Poodle. Ebony Great name for a black dog. Perhaps a Labrador Retriever. Gizmo This name is also on the Chihuahua names list because it reminds me of the funny character from the Gremlins movie. Indigo If you have an Australian Cattle Dog, also known as a Blue Heeler, this is a great name. Jade My wife had a cat name Jade and I really like this name. Jazz This is another of my favorite unique dog names. I picture a dog with black coloration. Maybe a Black Russian Terrier. That’s a very unique dog. Lava Another great name for the Black Lab Dog Names list. Limbaugh No, this is not a reference to the radio commentator. This is a very common last name, but a unique name for your dog. Macro Great name for large dog breeds. Madden Any football fans? Yes, this is definitely a reference to John Madden, the famous football TV man. Micro Great name for small dog breeds. Nemo Does your dog like to hide? Use this name and you could tell people how much time you spend finding Nemo (OK, bad joke). Noodles I love this for curly dogs. Great name for a Bichon Frise. Pebbles If you have two dogs, you could name your other dog Bam Bam. Pluto Yes, this is a very well-known Disney dog name, but I don’t hear it used much for “real dogs.” That’s why I put it on the unique dog names list. Radar As in Radar O’Reilly from the old M.A.S.H. TV show and movie. Sable Another good black dog name. Taz When I think of the Looney Tunes cartoon featuring the Tazmanian Devil, I think of the Chow Chow dog. It looks nothing like the real carnivorous marsupial found in Australia, but more like the cartoon. Go figure. Zeke One of my favorite one syllable dog names. I also think this fits on the hunting dog names list so I included it there. Zuri The name Zuri is Swahili for Beautiful. Love this name. Can’t find the name you like on the Unique Dog names list? Don’t give up. Try the unique male dog names list if yours is a male pup. You may also want to visit our Dog Names by Breed list or one syllable dog names list to do some more searching. If you have a great name, tell us about it!